Windows Object Explorer 64-bit（老毛子写的系统对象查看工具）_安全工具区_安全区 卡饭论坛 - 互助分享 - 大气谦和! 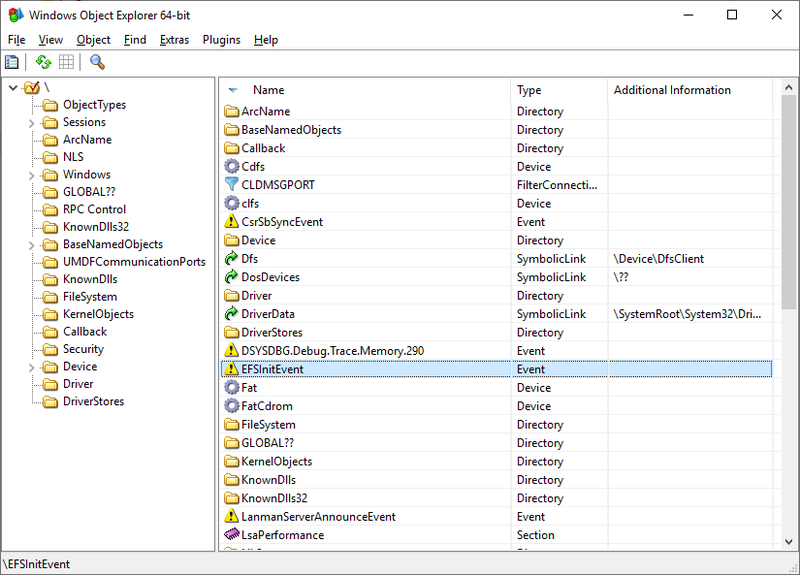 WinObjEx64 is an advanced utility that lets you explore the Windows Object Manager namespace. For certain object types, you can double-click on it or use the "Properties..." toolbar button to get more information, such as description, attributes, resource usage etc. WinObjEx64 let you view and edit object-related security information if you have required access rights. WinObjEx64 does not require administrative privileges. However administrative privilege is required to view much of the namespace and to edit object-related security information. WinObjEx64 works only on the following x64 Windows: Windows 7, Windows 8, Windows 8.1 and Windows 10, including Server variants. WinObjEx64 also supports running on Wine, including Wine Staging. In order to use all program features Windows must be booted in the DEBUG mode. WinObjEx64 comes with full source code. In order to build from source you need Microsoft Visual Studio 2013 U4 or Visual Studio 2015 and later versions. v141 for Visual Studio 2017. If v141 then select 10.0.17134.0 (Note that Windows 10.0.17134 SDK must be installed). Powered by Discuz! X3.4( 苏ICP备07004770号 ) GMT+8, 2019-4-20 18:58 , Processed in 0.038350 second(s), 3 queries , MemCache On.